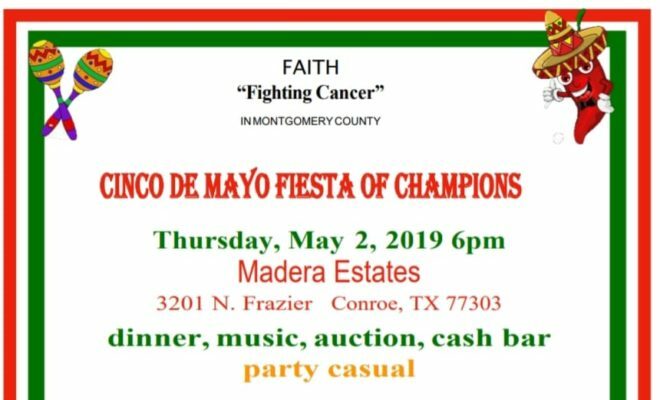 MONTGOMERY COUNTY, TX – FAITH Fighting Cancer in Montgomery County announces the date of its second Cinco de Mayo Fiesta of Champions is Thursday, May 2. 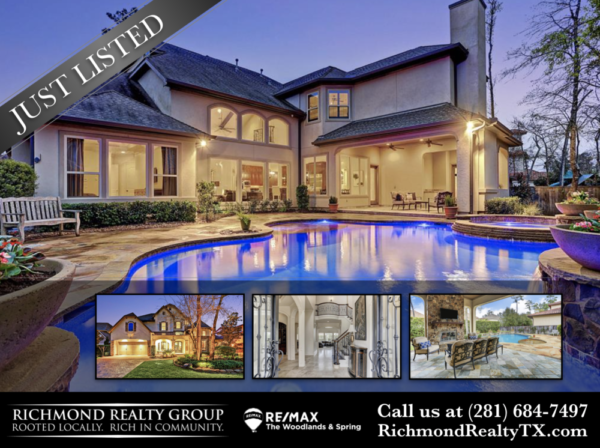 The fun-themed fundraiser will be at 6:00 p.m. at the beautiful Madera Estates at 3201 North Frazier Street in Conroe. The “Party Casual” dinner will feature “fiesta fajitas” from El Bosque plus awesome silent and live auctions. The famous Ray Burgess is the auctioneer this year. This evening of fun will only cost $100 per person to enjoy the festivities, $750 for a table of 8, $900 for table of 10, or $1,100 for table of 12. The night is to honor the selflessness of FAITH’s Champions in their efforts to help others in our community. The event not only highlights the struggles of many, men, women, children, and their families fighting cancer but also the superb medical facilities in our community. Each Champion has had a different experience and shares their feelings to help raise money to help others. All money taken in for the Champions go to their respective causes. Contributions received through Steve Smith’s solicitations will benefit Houston Methodist The Woodlands Hospital. Donations received on behalf of Eliud Arrazate will benefit MD Anderson The Woodlands and FAITH’s Designated Fund there. Dr. Kenneth Davis’ solicitations will benefit Lone Star Family Health Center. Champion Rowena Hayes has designated the Healing Arts Program of Memorial Hermann The Woodlands Medical Center’s Canopy Cancer Survivorship Center to receive her contributions. 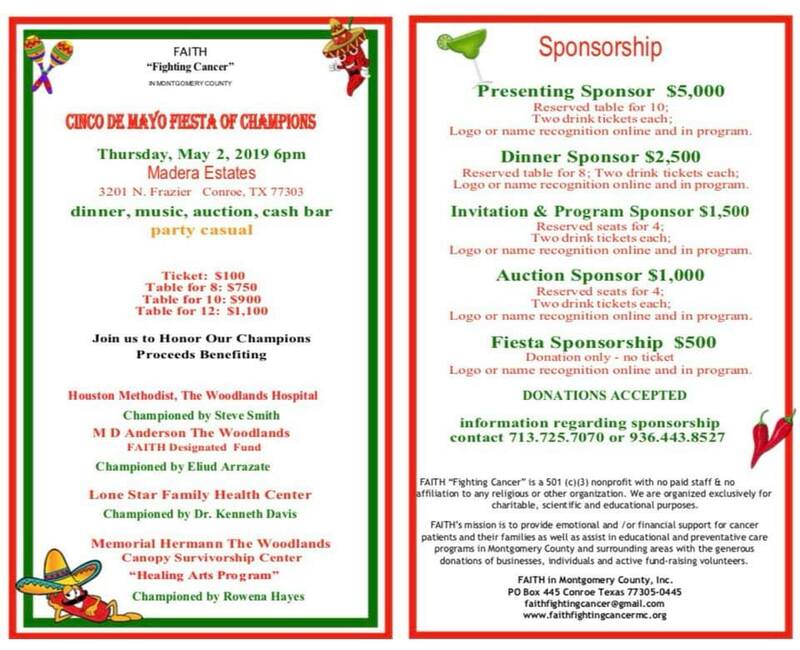 For Fiesta ticket and sponsorship information, please call 713 725-7070 or e-mail faithfightingcancer@gmail.com. Donations for any of the Champions’ causes may be mailed to FAITH Fighting Cancer in Montgomery County at P.O. Box 445, Conroe, Texas 77305. 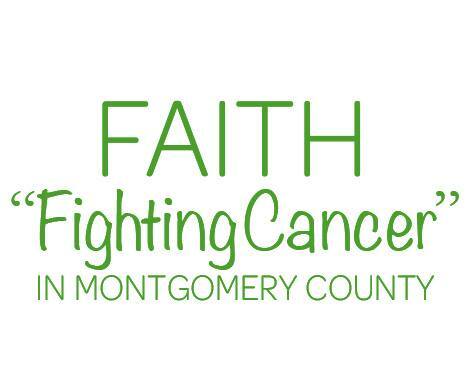 FAITH Fighting Cancer in Montgomery County is a 501©(3) non-profit organization, which is run entirely by volunteers. Most of them have dealt with cancer either personally or with close family members and friends. The dedicated ladies realize that not only the patient, but also the entire family, can go through traumatic changes–and assistance may be hard to find. FAITH’s goals are accomplished through generous donations from businesses, individuals, and dedicated fundraising volunteers. Since 2010, it has raised more than $500,000. Through its programs, hundreds of Montgomery County citizens have been assisted.